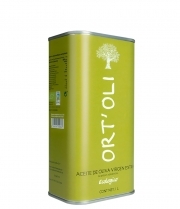 Ort'Oli - Tin 1 l.
Extra virgin olive oil obtained mainly from the empeltre variety or a mix of empeltre with secondary varieties such as arbequina, morruda y farga. Good flavour, fruity taste at the beginning of the season and slightly sweet as the season wears on. With aromatic connotations that remind you of almonds and green nuts. The production zone includes the Terra Alta municipality and some other municipalities in Ribera d'Ebre, both situated in the south-east of Catalonia. The municipalities that form part of this region include Arnes, Ascó, Batea, Bot, Caseres, Corbera d´Ebre, Flix, Gandesa, Horta de Sant Joan, La Fatarella, Pinell de Brai, Pobla de Massaluca, Prat de Comte, Ribaroja d'Ebre and Vilalba dels Arcs.